When YotaScale detects and alerts you of a cost spike, it provides automated details to the exact right person in operations, engineering or finance so they can respond appropriately and quickly to cost anomalies and not waste their limited time chasing down cost spikes. There are enormous cost savings gained by understanding the true causes of anomalies. Our customers report that 25% of their time in cloud operations is trying to understand the reasons behind cost spikes. • Pinpoint the exact reasons for cloud cloud anomalies. Are you looking to have policy driven tag management for AWS? Want to learn how Yotascale automate the process of tagging AWS resources? In this webinar, we’ll sit down with Senior Solutions Architect, Jeff Harris, to explore how to take your AWS tag health to the next level with contextual cost allocation by application or business unit. • Set auto-tagging policies to manage and track all cloud resources. Tune in Tuesday, March 5th at 2pm ET / 11am PT. If you can't make the webinar, register anyway and we'll send you the recording. Over-provisioning in AWS can be a costly cloud computing mistake. Quite simply, DevOps teams are often purchasing too much cloud computing power. Enterprise Architects and IT professionals over-provision infrastructure, buying capacity just in case they need it, but the cloud allows you to spin up infrastructure as you go and as you need it. Another common mistake is that people are a little too slow in buying reserved instances, which is Amazon's way of lowering the hourly cost of infrastructure in exchange for a prepayment. • How to right-sizing the nodes with a larger footprint. Cloud services can have a 35% underutilization rate in the absence of effective management, as resources are oversized and left idling. Companies are wasting over 40% per year on unutilized cloud services. This amounts to over $10B of the $22B spent on AWS services last year. In the course of regular cloud operations, resources can be abandoned and accrue charges without contributing value. YotaScale delivers valuable, cost-saving recommendations for fine-tuning your cloud resource utilization, optimizing around cost, performance and availability. YotaScale lets you dive deeper into your cost and usage data to identify trends, pinpoint cost drivers, and detect anomalies. Once an anomaly is detected, Yotascale sends a notification through slack or email and provides deep root cause analysis. • How an automated, proactive early-warning detection system into AWS cost anomalies can save money. • Root-cause discovery and analysis—including why a cost spike happened. • Mapping unwanted costs spikes to the appropriate cost centers, products, and applications. Are you looking to cut cost on your AWS cloud infrastructure? Want to learn how YotaScale AI-powered cloud optimization can reduce your spend by up to 40%? In this webinar, we’ll sit down with Senior Solutions Architect, Jeff Harris, to explore how to take your cloud strategy to the next level with AI, machine learning, and diverse analytics to deliver actionable insights and cost savings. • What the most innovative enterprises in North America and Europe are doing for cloud optimization. • The pitfalls of using manual processes and decisions for your cloud strategy. • How to make impactful decisions around cloud cost management. Tune in Tuesday, September at 10 am PDT. 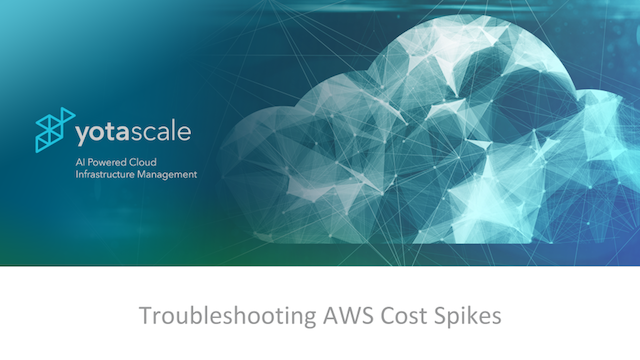 Yotascale, a leader in Cost Management for AWS, provides cloud operations and finance teams predictable cloud costs. Cost allocation, visibility, planning, and optimization are key features of Yotascale software that enable an effective cost management strategy. Enterprises deploy Yotascale software to bridge the gap between CloudOps, engineering, and finance teams to fulfill fiscal responsibility while taking advantage of the agility of the cloud.